The U.S. Food and Drug Administration (USFDA) today approved Iressa (gefitinib) for the first-line treatment of patients with metastatic non-small cell lung cancer (NSCLC) whose tumors harbor specific types of epidermal growth factor receptor (EGFR) gene mutations, as detected by an FDA-approved test. 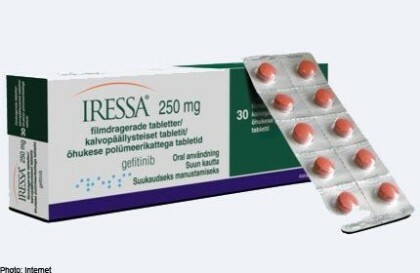 Iressa is a kinase inhibitor that blocks proteins that promote the development of cancerous cells with certain EGFR mutations. It is intended for the treatment of patients whose tumors express the most common types of EGFR mutations in NSCLC (exon 19 deletions or exon 21 L858R substitution gene mutations). Thetherascreen EGFR RGQ PCR Kit was approved as a companion diagnostic test to identify patients with tumors having the EGFR gene mutations in order to determine which patients would be appropriate for treatment with Iressa. “Iressa offers another effective first-line therapy option for selected lung cancer patients. This approval provides further support for a highly targeted approach to treating cancer,” said Richard Pazdur, M.D., director of the Office of Hematology and Oncology Products in the FDA’s Center for Drug Evaluation and Research. The FDA granted Iressa orphan product designation for the treatment of EGFR mutation-positive metastatic NSCLC. Orphan product designation is given to drugs intended to treat rare diseases, which provides financial incentives – like tax credits, user fee waivers, and eligibility for market exclusivity – to promote their development. The efficacy and safety of Iressa for this use was demonstrated in a multi-center, single-arm clinical trial of 106 patients with previously untreated, EGFR mutation-positive metastatic NSCLC. The study’s primary endpoint was objective response rate, or the percentage of patients who experienced complete and partial shrinkage or disappearance of the tumors after treatment. Participants received Iressa 250 mg once daily. Results showed that tumors shrank in about 50 percent of patients after treatment and this effect lasted an average of six months. The response rates were similar in patients whether their tumors had EGFR exon 19 deletions or exon 21 L858R substitution mutations. Iressa may cause serious side effects including interstitial lung disease, liver damage, gastrointestinal perforation, severe diarrhea and ocular disorders. The most common side effects of Iressa are diarrhea and skin reactions (including rash, acne, dry skin and pruritus, or itching). Iressa is marketed by Wilmington, Delaware-based AstraZeneca Pharmaceuticals. The therascreen EGR RGQ PCR Kit is manufactured by QIAGEN Manchester Ltd., based in the United Kingdom.